Trade show success is based on a variety of factors, most of which include a fair amount of planning and organizing by a team. What happens when the team doesn’t get along or when some people don’t feel that their ideas are being heard? It often causes stress and ultimately it can hurt the trade show success for your business – And THAT impacts the bottom line. In today’s workplace we can have as many as five generations of employees all working toward the success of the company. 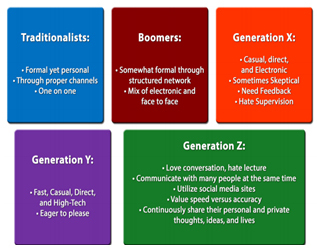 How they receive, interpret, and execute plans differs based on, among other things, their age and generation. Think about how your parents work versus how you work, for example. Ask your grandparents about their work ethic and then ask what they think of today’s workplace. You’re bound to gain some keen insights into the generations in the workplace. Each of these generations brings their own ideas about being employees. Born before or during World War II, this generation values privacy, hard work, trust, formality, and social order. These will probably be the quietest people on the team as they are not known to easily share their thoughts. Focused more on words than body language, the preferred communication for traditionalists is face-to-face or written. Social media is probably not an option for most of this generation, at least not for business. TIP: Don’t waste their time or make them feel their time is being wasted. While they are quiet, they are also quite experienced. Find a way to use their experience to benefit your marketing or trade show efforts and you’ve got an engaged member of your team willing to work toward goals and success. Born just after World War II to parents of The Great Depression, this generation values competition, change, hard work, success, body language, anti-rule and regulation, and inclusion. Known as the show me generation, baby boomers are keen observers of body language and speak in an open, direct style. In the workplace, they want to know if their efforts are useful and how what they do applies to the bigger corporate goals. TIP: Younger Boomers prefer in-person meetings, webinars, and video phone calls and prefer to be in control of the message of the conversation. Baby Boomers are typically experts in a variety of areas which can prove valuable to your team if you let them be participants in the conversation. Sandwiched between the retiring Baby Boomers and tech savvy Gen Y, Gen X-ers value entrepreneurial spirit, loyalty, independence, creativity, information, feedback, access to information, and work-life balance. The first generation to recognize the value of working from home, they are strong leaders and fast learners. TIP: Keep Gen X-ers in the loop with informal communication and keep them challenged. While Boomers are working hard to move up the ladder, Gen X-ers are working hard so that they can have more time to balance work and life responsibilities. The largest generation and a major source to replace retiring Baby Boomers in the workplace, Gen Y-ers value positive reinforcement, autonomy, positive attitudes, diversity, money, and technology. Influenced by today’s technology, they love to communicate via email, texting, and social media. TIP: This is the love-me generation and they are constantly seeking feedback on their performance. Rather than a quarterly or annual review, consider a monthly review for these employees. Generation Y-ers are sometimes challenging for the older generations to understand as they are working to live, not living to work. Create an environment that is fun and interactive and you will have engaged employees. This is a unique generation as they have grown up with the internet and technology. Socializing to them may mean sitting in a room texting or messaging a colleague rather than a phone call or face-to-face conversation. Experts in electronic gadgets and social media, they can help your team with a social media marketing plan. TIP: Keeping this generation focused is key to their (and your) success. This generation is especially concerned with the environment making them ideal to lead green marketing campaigns. 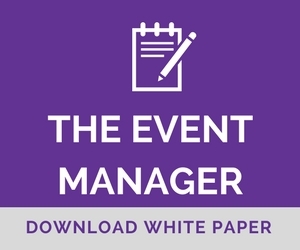 When you think about your trade show marketing plan, it is important to consider how each of your team members contributes to projects in their own unique way. From the quiet Traditionalists and expert Baby Boomers to the younger generations focused on work-life balance and the environment, you can begin to embrace strengths that not only lead to trade show success, but to the success of your business overall. At EXHIB-IT! we are focused on helping our clients engage and retain customers through effective trade show marketing. Contact us today to get started!